At first I thought I had made a mistake when I realized I had not put any butter in these biscuits. It's no mistake! These biscuits have cream instead of butter in them. I wasn't sure how they would turn out but they were surprisingly very similar to traditional biscuits. If you look closely in the photo, you'll see that my biscuits were flower shaped :) That's because I used a cookie cutter to make my biscuits since I don't have a biscuit cutter. So how did these taste? These aren't as sweet as the name implies, and I think I may miss the nice buttery taste that comes with traditional biscuits, but if you're making biscuits at the last minute and realize you're out of butter, then these would make a great alternative. I enjoyed my biscuits with some wild raspberry honey that I won from Blake Makes courtesy of Bee Raw. They say that the flavor of the honey comes from the flowers that the bees have pollinated and it's so true. The floral raspberry flavor in this honey is subtle, but definitely there. I really enjoyed it. 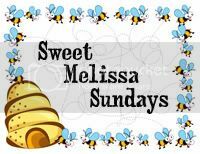 Thanks Melissa, for hosting this week. If you would like the recipe, you can find it here. Make sure you check out the TWD Blogroll, to see how everyone else enjoyed this breakfast treat! - Make sure you add enough cream to get the dough moist enough to stick together so it doesn't crumble when you roll it out, but not too moist to where it's too sticky to work with. They look fantastic! Wonderful picture! That honey sounds amazing Jaime and I bet it was fabulous on your biscuits! My biscuits were pretty flat but yours look like they rose beautifully. 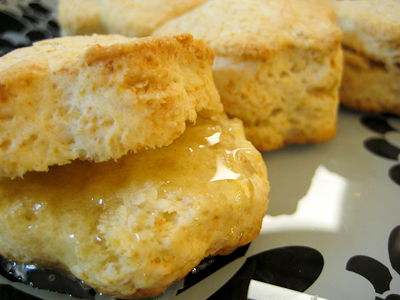 mmmm, biscuits and honey are an inspired combination! I love your flower shaped biscuits. Oooh these look amazingly good, I bet they were so tasty with the honey! it's hard for me to imagine a tasty butter-less biscuit, but i won't knock it til i try it. nice improvisation, using the cookie cutter in lieu of a biscuit cutter! Nice job on the biscuits. I agree they won't replace my go to biscuit recipe, but they will come in handy. These look delicious! And very intriguing!